CSS, one of the country’s biggest health insurers, launched a pilot project in July, in which the company tracks the movements of 2,000 volunteers on a daily basis using digital pedometers. The program is intended to aid insurance companies in tailoring their offers to their customers’ needs. To borrow from ‘Taylor Swift’, We will never ever ever …wear an iWatch (despite how cool we secretly think they look). So we are really excited by the new #androidwear coming out in time to vie for your holiday bonus bucks. Here’s a peek at the ASUS model, expected in to hit stores next week. The Activité, by Withings, is a fashionable analog device (designed in France, and built in Switzerland), that leverages a retro design, while offering the activity and gps-enabled features of wearble-tech gadgets. And it looks smart, without looking like a smartwatch. Google; in your home, on your streets and, soon, on your wrist! 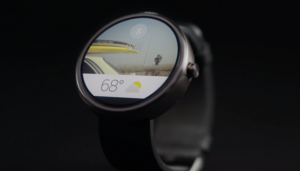 The Google smartwatches, or Androidwear, are coming to a mall near you. Watch this video from GoogleMobile to see why you want one. Spoiler alert: you’re cell phone’s days are numbered.